Free Shipping Included! 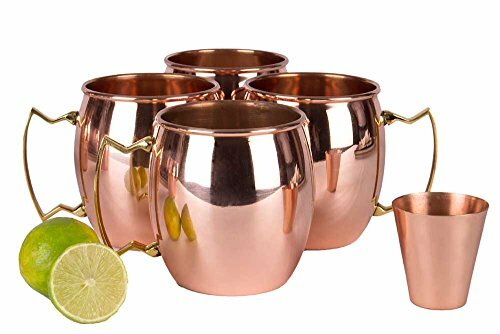 A29 Moscow Mule 100 % Solid Pure Copper Mug /Cup (16-Ounce/Set of 4, Hammered) with BONUS Shot Glass and Free Recipe Booklet by A29 at Foom App. MPN: 43178-130958. Hurry! Limited time offer. Offer valid only while supplies last. As all good mixologists know, the cocktail, Moscow Mule was the way vodka was introduced into America in the 1940s. By the 1950s it was all the rage. 16 OZ CAPACITY HAS NUMEROUS USES--Our Copper Mug works great for chilled beer, iced coffee, iced tea and any vodka, gin, rum, tequila, or whiskey mixed drinks. Additionally, many experts tout the benefits of drinking water from 100% copper drinkware. The generous 16 oz size is the perfect amount to hold your drink and ice cubes without worrying about spills. Our copper cups feature a smooth lip that lets you drink in comfort, unlike the sharp edges found on other mugs. Make for a great gift!